Apex Legends is one of the newest Battle Royale games released in 2019, and for the time being, it’s the number #1 game being streamed on Twitch, being streamed by some of the most popular streamers out there! That being said, it seems that Apex Legends has quickly managed to find its way up there, next to Fortnite and PUBG, and it looks like it’s here to stay! Now, as we all now, when it comes to BR games, their competitive aspect along with the desire to be the last man standing sometimes can result in quite a few unpleasing events, ranging from false reporting to even getting locked out or even having your account banned from Apex Legends, which is also what happened in the first Apex Legends ban wave yet, on February 2019. Of course, that’s not to say that such popular games don’t have their “fair share” of actions against the rules that do result in account bans. So, with that in mind, we decided to cover up a guide on how to submit an Apex Legends unban appeal, which is somewhat the same process as for Battlefield Firestorm, should you find yourself in this unfortunate situation. Let’s first start by going through what can actually get you banned from Apex Legends! What can get you banned from Apex Legends? selling/buying for real money – anything related to Apex Legends cannot be sold or bought for real money, such as accounts, currency, in-game items and anything else that can be bought or sold. For a more thorough read about what’s deemed against the rules and ultimately what can get you banned from Apex Legends, you can throw an eye on the EA ToS. Now, getting to one of the most asked questions in regards to such situations bans, whether or not you can get unbanned from Apex Legends! Can you get unbanned from Apex Legends? While there is no general answer that applies to all Apex Legends account bans, nor a particular way of accurately saying upfront which is which, yes, you can get unbanned from Apex Legends, albeit of course, not everyone or every account. (You can right click the image and press “Open in a new tab”). The biggest factor of an Apex Legends unban is essentially the reason for which you got banned in the first place. For example, if you’ve gotten banned from Apex Legends for extreme toxicity, racism or real life threats, then the chances of getting unbanned are extremely low to none. On the other hand, if you’ve gotten banned from Apex Legends for, let’s say, having your account breached, or for no reason, under the allegation of cheating, then yes, you do stand a good chance of getting unbanned from Apex Legends! And, saving the best for last, let’s see how to submit an Apex Legends unban in order to try and get unbanned! How to submit an Apex Legends unban appeal? So, in the unfortunate event where you found yourself banned from Apex Legends, your best bet is of course, to submit an unban appeal. 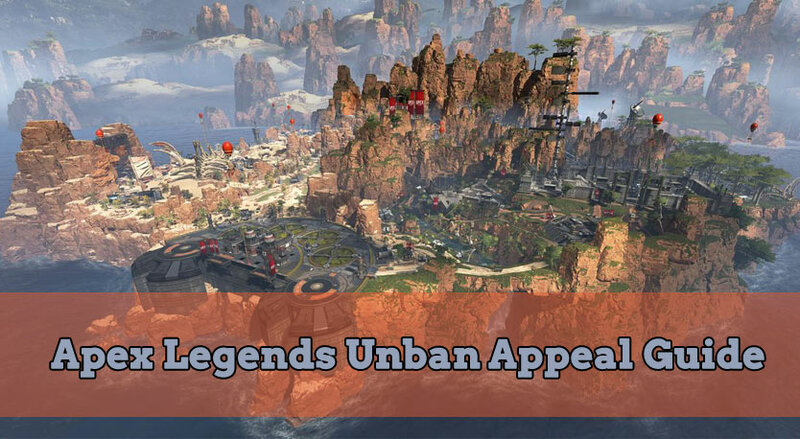 That being said, let’s see how that can be done, in our Apex Legends unban appeal guide below! Step 1: First thing that you need to do in order to start your Apex Legends unban appeal process is to go on its EA Help page right here. Step 2: On here, scroll to the very bottom of the page, and click on “Contact us” then proceed on selecting the platform you’re playing Apex Legends on, which in our guide’s case is “PC“. 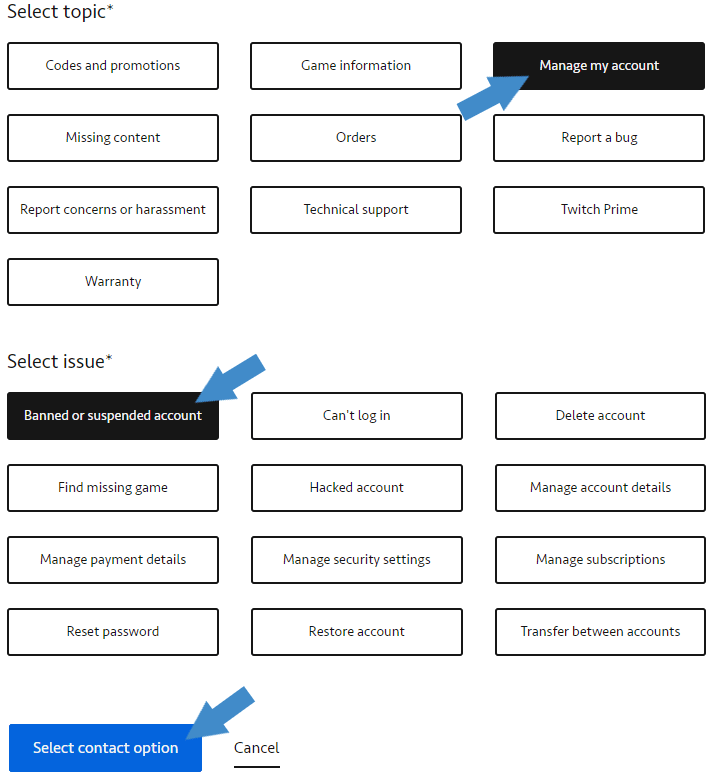 Step 3: Under “Select topic”, make sure to choose “Manage my account“, followed by choosing “Banned or suspended account” under “Select issue”. Step 4: Proceed to clicking on the blue “Select contact option” button underneath, then click on Email. input your Apex Legends user name, and make sure you spell it correctly. 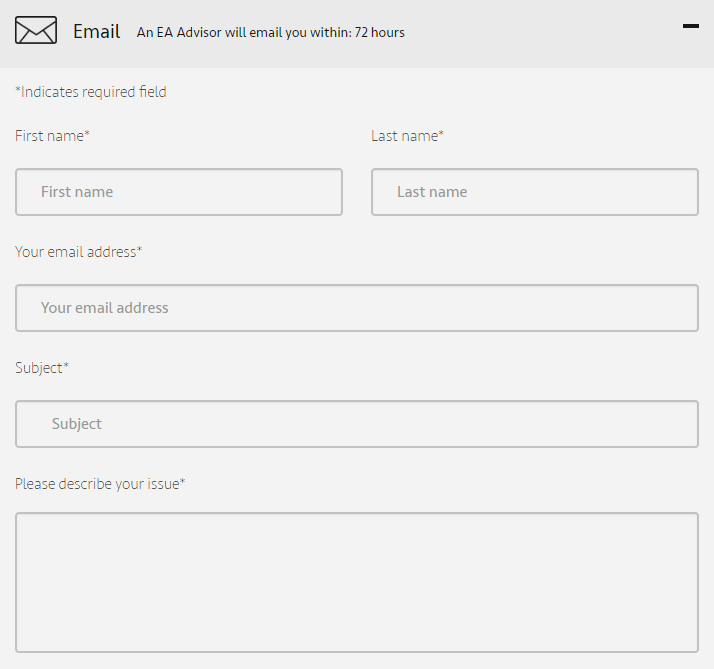 Once all of that is done, simply press the “Email us” button underneath the Apex Legends ban appeal, and your ticket will be sent to EA Support. You’ll receive their answer via mail, the one you’ve put in the Apex Legends account unban form, so make sure to keep an eye on it, as well as on the Spam folder! Need help with a banned Apex Legends account? We're here to give you the best help in order to get your Apex Legends account unbanned! Get unbanned from Apex Legends!